The Crystal Ray LED is Eliminator Lighting's first dual lighting effect. It's crystal like shell and variety of built in programs and patterns are several features that will make your next installation or gig a memorable one! 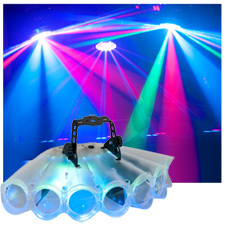 With a total of 112 LEDs it will be sure to light up and stand out at every show. The Crystal Ray LED offers 4 operation modes: Auto, Macro Colors, Sound Active & DMX. Whether you want to control the color of your beams or have it running sound active you will always have energetic colored beams illuminating the dance floor. You can run the multiple built in effect programs in Master/Slave mode with or without a DMX controller. The multiple programs in the Crystal Ray LED can either be run in Sound Active mode on one single light show or you can choose to run through all its light shows.